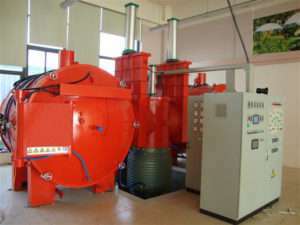 Vacuum heat treatment furnace in a near vacuum state refers heated by electric heating elements for industrial furnaces. Vacuum heat treatment furnace cooling system is an important part of the vacuum heat treatment furnace. Cooling water should be kept smooth through, otherwise the water temperature increased downtime. This is the vacuum heat treatment furnace could cause major destruction vacuum heat treatment furnace work is often ignored when unattended. Vacuum heat treatment furnace will appear after prolonged use molybdenum heating body harden, shrink, falling, lodging first lap, after fusing (melting) phenomenon. For the vacuum heat treatment furnace heating wire presence necessary strength at high temperature, anti-line hardening, collapse or sag, first to design construction size of the vacuum heat treatment furnace heating wire, such as spiral resistance wire, pay attention to the heating element bend diameter, pitch and screw diameter and the like. Heating body is about to loose by vacuum heat treatment furnace insulation lining, put in insulation lining 95 ceramic pieces, leaving its proper expansion space. Resting position to fit, usually in a 100 ~ 200mm, and can prevent the resistance wire sturdy hook lie. Also should avoid direct contact with each other furnace wire (short), generally to pad spacer. Using biodegradable chemical assisted approach to cooling water, the purpose is to keep the minerals in suspension, to reduce hose, coils and water jacket precipitate accumulation to make the water flow. This is typically accomplished using an automatic device, which can monitor the water conductivity, automatic replenishment chemicals, wash water, add fresh water. And affiliated with the vapor filtration system, this approach can also ensure that the water of pH control, prevent unnecessary mineral deposits in the cooling water system. After the system is stable, at least once a month to prevent water quality tests had been treated or under treatment. Vacuum furnace shell heat exchanger material and the test sample should also be placed in the waterway system, do a weight loss of the annual inspection to check the effect of treatment. Diffusion pump serpentine tube cooler must pay special attention. It should be regularly checked. If blocked, diffusion pump will overheat and loss of function, but also lead to further diffusion pump heater burned, causing an expensive, time-consuming repairs. When the serpentine cooling pipes clogged the waterway off with water, drain and blow through with compressed air or washed with a dilute acetic acid solution.